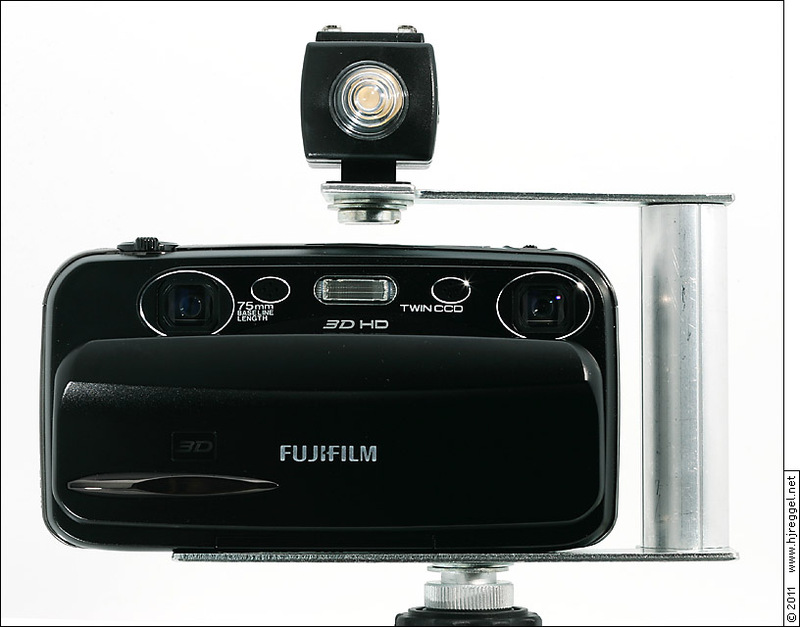 with the FujiFilm Real 3D W1 or FujiFilm Real 3D W3 cameras. Why do you need an external flash unit? The specifications give a flash range of 3.7m (wide angle) to 3.3m (telephoto) for the W1, and 3.6m (wide angle) to 3.1m (telephoto) for the W3. That sounds good, but the values are calculated for a sensitivity of ISO 800 and open aperture. In other words: You get half the range at ISO 200 (the highest acceptable setting for these cameras), not to speak about the range at ISO 100 with a maximum range of 1.3m. The figures calculate into an average guide number of about 4.7. The poor guide number of the internal flash is the main reason for using an external flash. Using aperture settings of F5.0/F5.6 at ISO 100 helps a lot to improve the image quality. But other benefits of an external flash are a reduced red-eye effect and the elimination of the "dust spot" phenomenon, which is very annoying in stereo photography. There is no hot shoe or any other accessory shoe. At least there is a tripod mount thread, where a flash bracket can be attached. The cameras are not designed to be used with an external flash unit, there is no PC sync socket, either. The external flash has to be triggered optical from the built-in flash. A serious drawback is the metering pre-flash that can't be turned off. This means that the optical trigger must have the option to ignore the metering pre-flash, and fire along with the main flash. There is no possibility of setting or adjusting the flash output level, either. The internal flash will fire at full power in most cases, leading to a long flash recycle lag between two shots - not to speak of the unnecessary battery drain. This is a serious pain with the 3D W3 model and its small battery. The only good point is that the FujiFilm Real 3D W1 and W3 cameras offer full manual mode where sensitivity, aperture and shutter time can be set. The sensitivity can be set to ISO 100, 200, 400, 800 or 1600 (full stops), where only ISO 100 and ISO 200 give more or less "acceptable" image quality. The cameras have only three aperture settings: F3.7/F5.0/F8.0 at full wide angle and F4.2/F5.6/F9.0 at normal and telephoto zoom. This calculates to 5/6 stops between open and medium aperture, 1 1/3 stops between medium and closed aperture, and 1/3 stop difference between wide angle and medium/telephoto zoom. Only the shutter speed can be set in 1/3 stops from 1/2s to 1/1000s. Unfortunately, there is no custom white balance mode, so the white balance must be set to daylight to approximately match the white balance of the flash. Of course, this only applies if there are no gel filters used in front of the flash head. A suitable flash unit must either support a full manual mode, where the output power can be set to a specific value, or support an auto mode with a built-in metering sensor. There are some "digital slave" flash units available with built-in pre-flash suppressing optical trigger and metering sensor. For a start, I chose the Bilora Digital-B D 22 iS intelli flash 120. The only reason for using this model was the fact that thought it would be really cheap: 22 Euro plus p&p. In the meantime, I found a very similar model as Unomat B18 digi auto Flash at 18.99 Euro with free shipping. Flash units with built-in optical trigger only require a "cold shoe" for mounting. Using a Canon DSLR, I also have "decent" flash units to test with. The Canon Speedlite 580EX II flash unit supports manual auto mode with internal metering sensor when C.Fn-05 ist set to "3". Besides that, the Canon 550EX, 580EX and 580EX II offer manual power settings from 1/1 down to 1/128. While the old 550EX can only be adjusted in full stops, the 580EX and 580EX II can be adjusted in 1/3 stops. Unfortunately, the flash range indicator does not work in M mode without EOS camera attached. The 4 series flashes should work as well, all models below don't have manual controls on the flash unit, and therefore cannot be used. The Canon 4 and 5 series flashes don't support simple optical triggering, so an external optical trigger is required. The Seagull SYK-5 Flash Remote Controller is an optical "hot-shoe" flash trigger with adjustable pre-flash sequence delay from 70ms to 1.5s. It can be securely mounted on a 1/4" thread to support the weight of a large flash unit. Please note that the 580EX II including batteries has a weight of about 520g, while the camera has a weight of about 250g, including battery and memory card. In order to mechanically attach the flash unit to the camera, a flash bracket that attaches to the tripod mount is required. The aim is to get the flash head above the camera right in the middle of both lenses. Because there is no portrait orientation needed, a simple fixed flash bracket will do the job. The center of the lenses differs about 2mm in respect to the tripod mount. The height differs about 2.5mm. The 3D W1 has buttons near the left edge of the camera. The 3D W3 has the parallax adjustment lever at the top left of the camera. 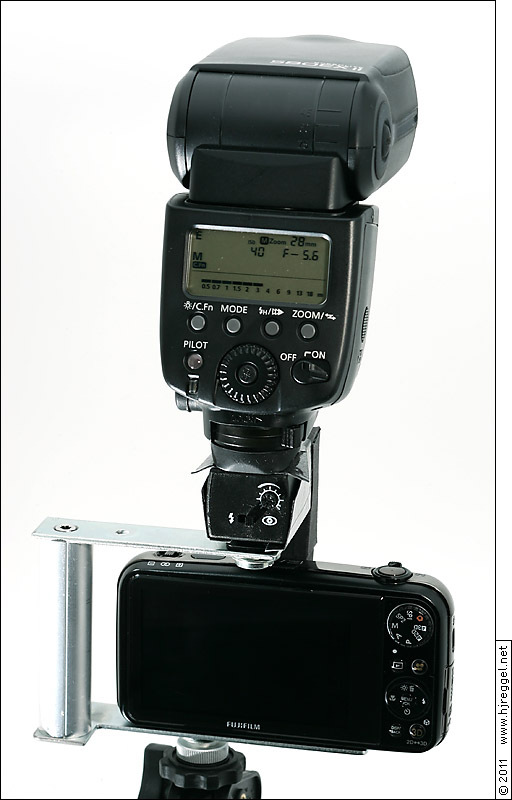 The height should be at least 72-75mm to leave room for the mounting screw of the flash shoe. With focus on the 3D W3, I decided to use a bracket design where the stem is at the left side of the camera with a displacement towards the rear of the camera. This leaves the parallax adjustment lever fully operational. To keep the first version at a low budget and easy to build, I chose two steel L-plates and an aluminum pipe with a wooden core. These are standard hardware store parts. The lower L-plate had to be trimmed at one side, the upper L-plate needed to be trimmed at both ends. The mounting screws are placed where the plates already had holes, cutting a 1/4" thread there will keep the mounting screws in place. For attaching the stem, two holes were required. Below is the bracket with the FujiFilm Real 3D W3 camera and Seagull SYK-5 flash trigger mounted. Please note that the hot shoe is slightly off-center towards the left lens, while the internal flash is off-center towards the right lens. The plain setup works fine indoors in normal sized rooms. For proper optical triggering, and to prevent triggering by other flashes, a sealed light path from the internal flash to the optical trigger has to be built. Please note that the entry window must be large enough because of the thermal power of the flash tube. While I built the first prototype from thick white paper, the following versions were built from thin matte black cardboard. The second version was built to swing out when the lens cover is closed, but for the final version I opted for a matchbox-like drawer. It has to be pulled out manually after opening the lens cover, but it will slide back in when the lens cover is closed. Another improvement is a rest from the upper part of the bracket to the top of the camera. This is not shown on the photos, but explains why the upper part of the bracket has the angled piece towards the front of the camera. In available light photography, there are three parameters for exposure: Sensitivity, aperture and shutter time. In flash photography, there is a small but important difference: The flash is a short strobe of light. The actual shutter time does not matter, as long as it is in a certain range: The shutter time can be as long as the available light does not lead to correct or over-exposure. Due to the triggering delay and the flash duration (and with certain camera models shutter curtain transitions), there is a lower limit for the sutter speed, called X-Sync time. Usually, the X-Sync time is somewhere from 1/125s to 1/250s. Within the range from available light exposure to the X-Sync limit, the shutter time can be used to set the balance between available light and flash. The important parameter for a flash unit is the guide number. This figure is a measure for the amount of the light, and is equal to the aperture setting multiplied by the subject distance at a given sensitivity, in general ISO 100. Aperture and distance influence the light by a power of two, while the sensitivity has a linear impact. This means that the guide number has to be converted using the square root of the ratio between two sensitivity values. Example: A guide number of 10 at ISO 100 is equivalent to 14.1 at ISO 200, giving a range of 3.5m at F4.0. When using a flash unit with internal metering, sensitivity and aperture settings must be matched up for camera and flash. The flash unit detects the light reflected by the scene, and cuts off the flash tube current, when correct exposure ist detected. This can lead to underexposure when highly reflective objects are in the scene, or if large and/or bright objects are in front of the subject. With the Canon 580EX II, sensitivity and aperture can simply be dialed in. However, there is no exposure compensation available. In case of wrong exposure, sensitivity or aperture settings must be altered. To keep the aperture setting at the actual value, the sensitivity setting can be lowered in case of under-exposure, or raised in case of over-exposure. According to the slightly confusing specification sheet, the Bilora flash has two auto modes, A1 for F2.8 at ISO 100 and A2 for F5.6 at ISO 100. If neither of these two modes gives proper exposure, the only way to influence the flash output is to use ND gel filters in front of the auto sensor. 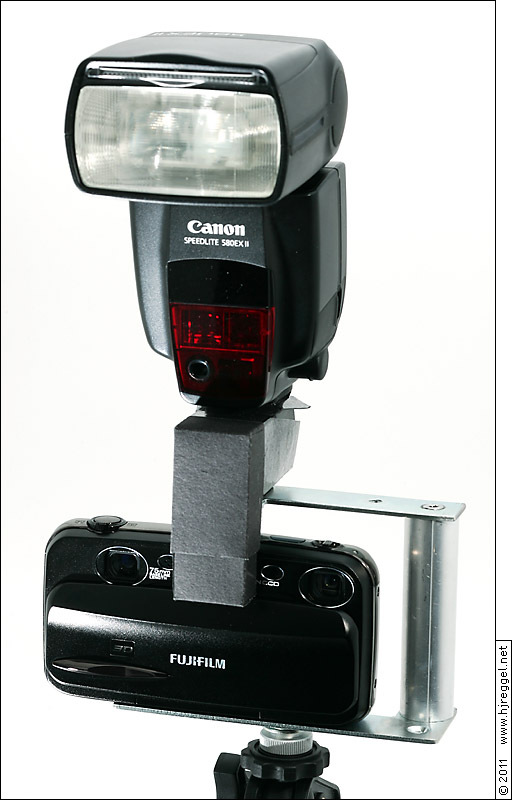 This will lower the detected amount of light, and is therefore supposed to increase the flash level accordingly. In manual mode, the flash can only fire at full power, with a claimed guide number of 22. Because the cheap Bilora/Unomat flash units have no proper control over the flash output, I decided to go for the big solution with Seagull SYK-5 trigger and Canon 580EX II flash unit. Once the SYK-5 setup works, it works remarkably well. Sometimes there are problems with the initial setup where the flash does not fire at all. I still did not find out whether it is the hot shoe, the mode switch, or something else. Given the weight of the flash unit, a higher and thicker stem with a little more distance to the side of the camera would be more convenient. Because the 4:3 format has a little more height than the 3:2 format, a manual zoom setting of 28mm is recommended for 35mm wide angle shots. With GN 30 at ISO 100, and medium aperture setting of f/5.0 or f/5.6, this gives a maximum flash range of 5.4-6.0m. At actual sensitivity/aperture setting, the photos are way underexposed. In a normal environment, I had to lower the sensitivity setting on the flash unit to ISO 40, raising the exposure by 1 1/3. However, raising the exposure too much is risky, due to the poor rendition of highlights with entry level compact cameras. I forgot to test the flash in manual mode, so I can't tell whether the underexposure is due to wrong metering, or a mismatch between the cameras ISO setting and the flash output. The white balance at daylight setting is not perfect, but OK. When I wanted to take some 3D photos using my standard off-camera flash setup, I was just about to pull out my radio triggers. But I decided to give the Canon transmitter a try. First, the slave flashes must be set up: The Canon flash units will enter E-TTL mode by default, whenever they are set to slave mode. The mode button does not seem to work, but when it is pressed for a longer time, the flash unit switches to M mode with blinking M. The blinking should not give cause for concern, it just seems to indicate the non-standard setup. The Canon ST-E2 Speedlite Transmitter will automatically start in non-TTL mode when no data communication is detected, and fire the flashes in full manual mode when triggered from the center pin of the hot shoe. The weight of about 140g including the 2CR5 6V Lithium battery does not get the camera out of balance. Standard radio triggers should work, too. But compared to the "native" wireless mode, each slave flash unit will require a receiver with additional batteries. A popular and affordable solution are the Yongnuo RF-602 radio triggers. The transmitter (RF-602TX) has a weight of about 35g including the CR2 3V Lithium battery, each receiver (RF-602RX) has a weight of about 50g including two AAA batteries. When I tested the Yongnuo RF-602TX on the Seagull SYK-5, I noticed that this combination does not work when the SYK-5 is in pre-flash suppression mode. It does work in instant triggering mode, but that does not help with the FujiFilm 3D W1/W3 cameras. The malfunction might be caused by the low trigger voltage of about 3.2V of the Yongnuo transmitter, where the Canon ST-E2 has about 3.7V, and the Canon 5 series flash units have about 4.5V. For me, the external flash is a "must-have" feature. The prototype shown here works very well, but I already have plans for a "proper" solution made from solid aluminum with a different geometry that allows full access to the battery door. With the battery drain of the 3D W3 model, this is a very important feature. Enough flash power for using ISO 100 and/or F8.0/F9.0. Enough flash power for longer distances. No dust spots in the images. Holding the bracket at the stem keeps the fingers of the left hand off the left lens. With the current design, the battery door is blocked, and the bracket has to be removed to get access. White balance set to daylight. ISO 100, 1/125s, F5.0/F5.6 at normal distance. ISO 100, 1/125s, F8.0/F9.0 at close distance. The Canon 580EX II is highly recommended due to its metering sensor. C.Fn-05 must be set to value 3 to activate auto metering mode. Flash zoomed to 28mm to cover the 35mm equivalent area of the 4:3 format at full wide angle. With the camera at ISO 100, a flash setting of ISO 40 gives good exposure (+ 1 1/3). The ST-E2 works fine with the slave flash units set to M mode. due to the lack of fine control over sensitivity and aperture in the camera. The second version of the bracket is still in the quick & dirty setup, but works as intended. With a stem of 23.5mm diameter, 80mm height, and 18mm distance to the camera, it is perfect to hold. A thin supporting bar that runs between the display and the controls turns the bracket into a solid frame. A special benefit of the new design is the fully operational battery/card door. The unreliable flash operation was due to three different issues, and therefore very hard to track down: The light path did not reflect enough light, so I added aluminum foil at the inside. The delay time of the SYK-5 must be set to the shortest possible setting. When carrying the camera with a neck strap, the setting can get mis-adjusted. The biggest problem is the quick lock mechanism of the Canon flash: The locking pin does not lock, not even when drilling a full locking hole. The clamp itself is not strong enough, the flash can slip backwards, so that the center pin gets off the contact pad. This means that after carrying the camera, the delay setting and flash position must be checked. Yesterday, I finally bought the new Canon 600EX-RT flash unit, and can confirm that it works fine with the Seagull SYK-5 trigger. The flash unit is 20-25g heavier than the 580EX II, and more expensive, but the metering mode is much easier to handle. Instead of entering the C.Fn settings, the required metering mode "Ext.M" can simply be set using the "MODE" button. The function buttons are assigned to activate Zoom, ISO and Aperture setting. After pressing the appropriate button, the values can be set using the main dial. Another benefit is the included filter holder with two different orange filters to adjust the color temperature to tungsten light. » Seagull offers several similar looking hot shoe flash triggers. However, the SYK-5 (not listed on their website) is the only suitable model from this series. 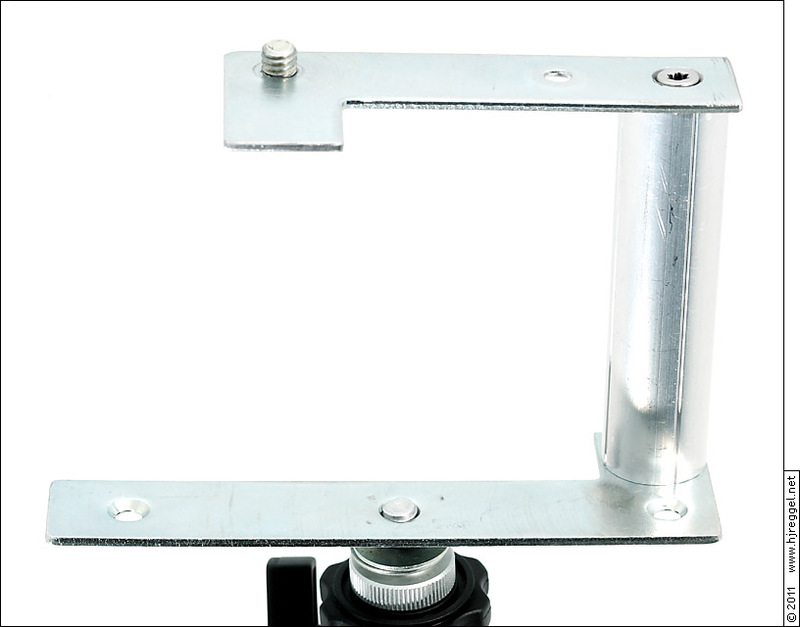 Seagull also offers different Shoe Mount adapters SC-0 to SC-8. Minolta/SONY users should be able to find an appropriate adapter for using the flash units on top of the SYK-5.